On 18 November 2017, a fire broke out in a building in Beijing’s southern Daxing suburb, killing 19 people including 8 children. Most of the victims were migrants who had come to Beijing from other parts of the country. According to the local authorities, around 400 people lived in cramped conditions in the two-story structure, which also served as a workshop and refrigerated warehouse for local vendors (Tu and Kong 2017). In the days that followed the tragedy, nearly 20 people were detained over the fire, including managers and electricians of the building. In response to the tragedy, on 20 November the Beijing government kicked off 40 days of citywide safety inspections, with a particular focus on warehouses, rental compounds, wholesale markets, and other constructions on the rural-urban fringes across Beijing (Zhu and Gao 2017). This led to a wave of evictions from the suburbs of the city. Without any notice, migrants who often had spent years in the capital were told to leave their dwellings and relocate elsewhere in the midst of the freezing north-China winter. While foreign media widely reported on the unfolding of the crisis, what was often overlooked is the outrage that was expressed in Chinese public opinion over the evictions. This essay seeks to fill this gap in three ways. First, it outlines how Chinese civil society attempted to resist the crackdown. Second, it puts forward a novel comparison between the official response to the fire by government of Beijing and that of London in the wake of the Grenfell tragedy. Finally, it considers the implications that the tragedy has had for local labour NGOs. Chinese civil society, in particular those labour NGOs that provide assistance to migrant workers, also did not remain silent. According to Wang Jiangsong, a professor at the China Industrial Relations Institute in Beijing, nearly 50 activists from different labour groups signed another petition letter condemning the government campaign (Wang 2017). Far more consequential was a ‘Suggestion Letter’, entitled ‘Beijing solidarity’, that was released on 25 November by a young graduate using the pseudonym Que Yue. Que suggested the establishment of a network of partners to conduct a field survey in the communities nearby in order to connect those in need of help with professional aid agencies. As more and more volunteers joined the cause, Que also set up a WeChat group aimed at drawing a participatory ‘Beijing Eviction Map’ that showed both the locations and number of people affected by the evictions (Qi 2018). In the days that followed, information poured in from different community actors, and a continuously updated document with information related to available assistance became a focal point of action. In charge of the editing was Hao Nan, director of the Zhuoming Disaster Information Centre, a volunteer organisation set up in the wake of the 2008 Sichuan earthquake that specialises in processing disaster-related information and coordinating resources. His job consisted of connecting NGOs, citizen groups, and individual volunteers to work together to collect, check, and spread information. NGOs and the citizen groups conducted investigations in several areas where evictions were taking place and disseminated information about available assistance among migrants. At the same time, volunteers were responsible for collecting useful information online and for checking that the information coming from those who offered to provide assistance was accurate. In an interview with the authors, Hao Nan described the difficulties in assisting the migrants, saying: ‘Some of the migrants actually did not need our help, and some of them thought our information was useless. For example, they needed to find places to live nearby, but we could only find cheap places far away from their neighbourhoods.’ Furthermore, most migrants could not access this kind of information due to the existence of different, and seldom overlapping, social circles on WeChat. Meanwhile, some NGOs in Beijing began to mobilise autonomously. On 23 November, the Swan Rescue Team (tian’e jiuyuan), an organisation set up in 2016 to provide emergency relief, began to offer migrants free assistance with their relocation. However, after a few days its leader suddenly announced that they would quit the rescue efforts, asking the public to ‘understand that we are nothing more than a particle of dust, what we can do is tremendously limited’ (Qi 2018). The New Sunshine Charity Foundation (xin yangguang) provided funding, medical treatment, temporary resettlement, and luggage storage to evicted migrants. The Beijing Facilitators Social Work Development Centre (beijing xiezuozhe) provided mental health support. Staff from the famous labour NGO Home of Workers (gongyou zhi jia), which was located in the area of the evictions, regularly visited migrants nearby and released updates for volunteers and journalists, but quickly received a warning from the government to cease these activities. Finally, the Tongzhou Home (tongzhou jiayuan), a worker cultural centre first opened in 2009, offered evicted migrants the chance to store their luggage or spend the night there. This went on until 28 November when its director, Mr Yang, was visited by police officers who told him to shut down the organisation. ‘I have worked in a factory, been a street vendor, and run a few small businesses—I know how hard it is to be a migrant worker,’ Yang said. ‘I don’t regret helping them. It was the right thing to do and there is nothing to regret’ (Qi 2018). Migrants themselves were not silent. According to witnesses and social media posts, on 10 December many of them took to the streets in Feijia village, Chaoyang district, to protest against evictions. Protesters shouted slogans like ‘forced evictions violate human rights’, while others held up home-made banners with the same message (Zhou and Zhuang 2017). The voices of the workers were recorded by Beijing-based artist Hua Yong, who in those weeks uploaded dozens of videos documenting the situation and his conversations with migrant workers on YouTube and WeChat. On the night of 15 December, he posted several videos on his Twitter account entitled ‘they are here’, referring to the police who was at his door to detain him. He was released on bail three days later (AFP 2017). Though not often linked, the events in Beijing recall the Grenfell Tower fire in London five months earlier. While occurring thousands of miles apart, the two accidents do have something in common. First, they both largely affected migrants. Although no official demographic statistics can be found publicly online, Grenfell appeared to be a very mixed community, with the 71 victims composed of a high proportion of migrants, including those from the Philippines, Iran, Syria, Italy, for example (Rawlinson 2017). Like in Beijing, there were also concerns about a possible underreported death toll, as some undocumented migrants were among the dead but were not accounted for. This is similar to the case of Daxing, where the community primarily consisted of non-Beijing citizens and 17 out of the 19 victims were migrants who had come from others part of China (Haas 2017). The only difference is that migrants in Daxing were interprovincial, whereas in the Grenfell Tower they were international. Secondly, migrants in both cases were mostly ‘low-skilled’, and from relatively poor and deprived segments of society. Being a social housing block in London, the Grenfell Tower accommodated a primarily low-income community. Xinjian village, where the fire broke out in Beijing, served the same functionality. It lies in the so-called rural-urban fringe (chengxiang jiehebu), where property is generally cheaper and infrastructure is of poorer quality. While white-collar migrants and college graduates can afford to rent in well-established communities, low-skilled (primarily rural) migrants tend to gather in places like Xinjian. In light of all these similarities, it is even more interesting to compare how the two governments reacted to the fires. Both had set goals to limit the total population of their cities, and both performed fire safety assessments all over the urban area. Nonetheless, as mentioned earlier, in spite of public outrage, Beijing authorities took this opportunity to evict rural migrant workers. Forced evacuation also occurred in other London high-rise apartment blocks that failed the fire safety checks after the Grenfell Tower incident, but the buildings were not torn down and revamped for weeks, during which time the government promised to ‘make sure people had somewhere to stay’ (Holton and Knowles 2017). In addition, the British Home Office also published the Grenfell immigration policy, which grants 12 months initial leave to remain and possible future permanent residency to the migrants involved in the fire. From this comparison, we can draw two lessons. The first is that previously ridged and clear borders have become subtle and invisible. This applies most clearly to Beijing, where, thanks to the economic reforms, the Chinese household registration system (hukou) is no longer serving as a de facto internal passport system that stops people from migrating. This means that Chinese citizens do not face explicit barriers in terms of moving within their country. But there are invisible walls in terms of welfare entitlements, as the hukou system still links provision of social services to the place of registration. And just as immigration policy in developed countries is more selective towards highly-skilled migrants, the conditions for granting a local hukou to internal migrants in big cities like Beijing are also geared towards attracting the wealthy or the highly-educated. 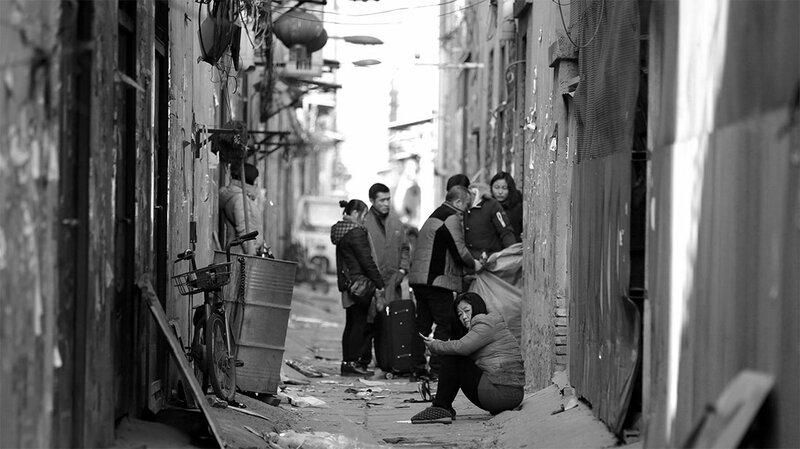 As a result, those low-skilled internal migrants are highly unlikely to obtain a Beijing hukou, and the Beijing government is not obliged to provide better housing for them. They are treated as second-class citizens in their own country. The invisible border is also seen in the living space of those low-skilled migrants. In China, most rural migrant workers have to reside in island-like slums whose connections to other parts of the city are cut off. For instance, the accompanying photo was taken in December 2017, when one of the authors visited Houchang village, a slum known for being home to many migrant drivers and chauffeurs. On the left side of the picture is the village where migrants live. The rooms are so small that some furniture has to be put outside. Just to the right of the road lies an advanced residential complex with private basketball and badminton courts. Behind this newly built accommodation is the Zhongguancun Software Park, where several high-tech IT companies are based. Right at the crossing, we saw a rubbish truck collecting waste from the software park, but just one street apart, in the village, there was not even one trash bin. We could not get an aerial view of the village, but one can easily imagine a segmented landscape, with the village area being stripped of access to public services and composed of basic infrastructure, but surrounded by fancy modern buildings within just ten meters of its perimeter. Every morning, migrants flock out to the city as drivers, delivery workers, etc., providing low-cost labour. In the evening, when they are supposed to relax, they squeeze back into the village. This scenario recalls the science fiction novelette Folding Beijing (Hao 2015), in which the city is physically shared by three classes, who take turns living in the same area in 48-hour cycles. Another lesson that we can draw from the comparison between London and Beijing is that under all migration management systems, it is low-skilled migrants who bear the brunt of the catastrophe whenever a disaster happens. High-skilled workers are rarely affected and can easily work around the situation, even when they themselves become targets. While the dichotomy between high-skilled and low-skilled seems to be neutral and focuses on learning rather than inherited qualities, we should always bear in mind that when people are low-skilled it is largely due to institutionalised factors, not simply a matter of bad luck or bad choices. Taking education as an example, big cities are rich in experienced teachers, museums, opportunities for international exchange, etc.—a situation that allows urban citizens to receive a much better education than that available to people in under-developed areas. Awareness of this is a first step to prevent disasters like the Beijing fire from becoming the justification to victimise already vulnerable segments of society. With a view to labour NGOs, the evictions have at least three layers of meaning: first, they highlight structural and demographic changes in the Chinese workforce; second, they show that there is an urgent need for labour NGO activists to find new strategies to conduct their activities; and third, they demonstrate that the political context is swiftly changing. According to our personal observations, migrant workers who dwell in Beijing’s urban villages work in a variety of industries that go far beyond traditional occupations in small retail, decoration, domestic work, vehicle repairing, etc. Today’s migrants work in industries that are characterised by the logics of modern large-scale capital investment, including logistics, delivery, and real estate. Although the specific distribution of employment by industry still needs to be investigated thoroughly, the abundant supply of information, as well as the increasing ease of transportation and communication, have already made it possible for the urbanised workers to respond promptly to challenges coming from changes in government policies. However, while the migrants themselves are increasingly able to respond quickly in the face of new threats, the response of labour NGOs—the traditional champions of migrant workers—to the evictions reveals the serious limitations of their current organisational approaches. It is well documented that labour NGOs first appeared in China in the late 1990s, and went through a phase of expansion in the Hu and Wen era, especially in the years that preceded the financial crisis. These NGO practitioners are first and foremost professionals in the fields of the law, social services, or occupational safety and health. To this day, these organisations mostly focus on providing individual legal aid, carrying out legal training and legal dissemination among worker communities, investigating violations of labour rights in factories, and organising recreational activities aimed at the working class. Through these activities, they are able to create short-term networks among their clientele, fostering fledgling feelings of solidarity. The mass evictions clearly exposed the deficiencies of such approach. On the one hand, these labour NGOs have already been hit by a harsh wave of repression in 2015 and 2016 that has severely undermined their ability to operate (Franceschini and Nesossi 2018). While those organisations and individuals that campaigned for a more militant activism based on collective bargaining today no longer exist or are unable to campaign, the remaining NGOs have no choice but to resort to self-censorship and limit their activities in order to survive. In addition, the core members of these organisations tend to consider themselves professionals rather than activists, and find themselves under considerable pressure from their families, peers, and state officials to avoid overly sensitive work. There are also clear class differences between NGO staff and the workers they assist, with the former largely belonging to the urban middle class and having a white-collar background. This gap was evident during the evictions, when the information and assistance services provided by these NGOs scarcely broke through social barriers to reach the workers. While labour NGOs are becoming increasingly powerless, the actions of these individual citizens provides some hope in the otherwise stark reality in which migrant workers remain trapped in a dire situation under increasing pressure from the world’s most powerful and undisguised police state. In light of this, it is our urgent duty to adapt to the rapidly changing socio-political climate, and make new alliance aimed at forging solidarity across different sectors of society, and developing more effective strategies and organisational models to support marginalised migrant workers and others who are falling victim to state repression in contemporary China. AFP (Agence France-Press). 2018. “Chinese Artist Hua Yong Detained after Documenting Mass Migrant Evictions in Beijin.” Hong Kong Free Press, 18 December. https://www.hongkongfp.com/2017/12/18/chinese-artist-hua-yong-detained-documenting-mass-migrant-evictions-beijing. Franceschini, Ivan, and Elisa Nesossi. 2018. “State Repression of Chinese Labor NGOs: A Chilling Effect?” The China Journal. 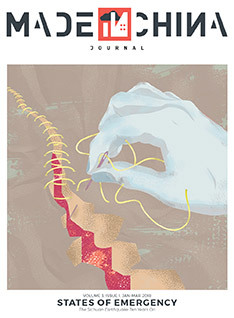 https://www.journals.uchicago.edu/doi/abs/10.1086/696986. Gao, Charlotte. 2017. “8 Top Chinese Intellectuals Demand Constitutional Review of Beijing’s Mass Eviction.” The Diplomat, 27 December. https://thediplomat.com/2017/12/8-top-chinese-intellectuals-demand-constitutional-review-of-beijings-mass-eviction. Haas, Benjamin. 2017. “China: ‘Ruthless’ Campaign to Evict Beijing’s Migrant Workers Condemned.” The Guardian, 27 November. https://www.theguardian.com/world/2017/nov/27/china-ruthless-campaign-evict-beijings-migrant-workers-condemned. Hao, Jingfang (translated by Ken Liu). 2015. “Folding Beijing.” Uncanny Magazine, January/February. https://uncannymagazine.com/article/folding-beijing-2. Holton, Kate, and Jamillah Knowles. 2017. “London Tower Blocks Evacuated as 34 Buildings Fail Fire Tests.” Reuters, 24 June. https://www.reuters.com/article/us-britain-fire/london-tower-blocks-evacuated-as-34-buildings-fail-fire-tests-idUSKBN19F071. Lo, Kinling. 2017. “Chinese Intellectuals Urge Beijing Authorities to Stop ‘Forcing’ Tens of Thousands of Migrant Workers Out of City in Wake of Deadly Fire.” South China Morning Post, 28 November. http://m.scmp.com/news/china/policies-politics/article/2121633/chinese-intellectuals-urge-beijing-authorities-stop. Meng, Zhu, and Xin Gao. 2017. “Beijing jiang jizhong 40 tian kaizhan anquan yinhuan dapaicha daqingli dazhengzhi zhuanxiang xingdong [Beijing Government Has Kicked Off 40 Days of Citywide Safety Inspections].” People.cn, 23 November. http://bj.people.com.cn/n2/2017/1123/c82840-30957026.html. Qi, Ah. 2018. “40 tian handong qingli: Minjian zijiu shilü [The 40-day Eviction in Winter: Voices from Chinese Civil Society].” NGOCN, 15 January. https://shimo.im/docs/6t94NJ4xMpsdamPz?from=timeline&isappinstalled=0. Rawlinson, Kevin. 2017. “The Victims of the Grenfell Tower Fire.” The Guardian, 23 November. https://www.theguardian.com/uk-news/2017/jul/13/grenfell-tower-fire-victims-dead-missing-identified-named-so-far. Tu, Ming, and Xiang Kong. 2017. “Beijing daxing ximen zhen xinjian cun fasheng huozai, yizhi 19 ren siwang [Fire Breaks Out in a Building in Beijing’s Ximen Township, Daxing District, Killing 19 People].” Xinhua, 19 November. http://news.sina.com.cn/c/2017-11-19/doc-ifynwnty4966179.shtml. Wang, Jiangsong. 2017. “Laogongjie renshi jiu Beijing da guimo qugan ‘wailai renkou’ zhi zhonggong zhongyang, quanguo renda, guowuyuan, quanguo zhengxie de gongkaixin [Open Letter About the Mass Evictions of Migrants from Beijing to the Central Committee of the Chinese Communist Party, the National People’s Congress, the State Council, and the Consultative Conference by Personalities in the Labour Field].” (@JiangsongWang, 25 November). https://mobile.twitter.com/JiangsongWang/status/934448437520506880. Weiquanwang. 2017. “Jiang Ping, He Weifang deng xuezhe lüshi dui Beijingshi zhengfu qugan wailai jumin de xingdong qi yiju de xingzheng wenjian xiang quanguo rendahui changweihui tiqing hexianxing shenzha de quanwen [Full Text of the Letter to the Standing Committee of the National People’s Congress by Top Chinese Scholars and Lawyers Requesting a Constitutionality Check of the Evictions in Beijing].” Weiquanwang, 24 December. https://wqw2010.blogspot.com/2017/12/blog-post_27.html. Zhou, Viola, and Pinghui Zhuang. 2017. “Migrant Workers Take to Streets of Beijing to Protest against Forced Evictions.” South China Morning Post, 11 December. https://www.google.com.hk/amp/m.scmp.com/news/china/policies-politics/article/2123714/migrant-workers-take-streets-beijing-protest-against%3famp=1. Qiaochu Li is a project coordinator at the Department of Sociology, Tsinghua University. Her research focuses on labour issues and civil society in contemporary China. She has been involved in the volunteer organisation and processing of assistance-related information following the Beijing evictions. Jiani Song is a researcher at Beijing Yilian Legal Aid and Research Center of Labor, a local NGO committed to advancing labour rights and to improving labour law in China. Her research interests include internal migration, labour issues, and civil society in contemporary China. Shuchi Zhang is a labour NGO and civil society practitioner, and a researcher at Beijing Yilian Legal Aid and Research Center of Labor.